The nine member boy band GreatGuys said on April 12, ‘TRIGGER.’ Following the release of the album, the company has opened images of each member since 1. 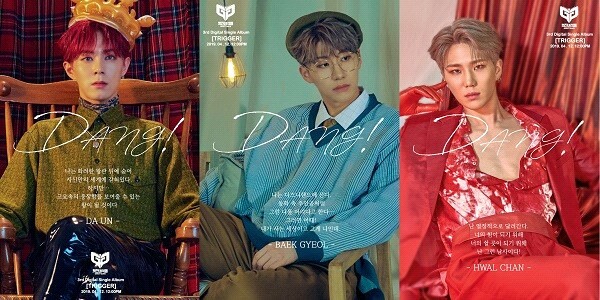 The title track ‘DANG’, each members images of the three GreatGuys opened with their respective world views on April 2. Also on 3, images of three more members are released, with three more teaser videos released on a daily basis. Activities following the release of a new report by the nine-member GreatGuys will begin with a Just K-pop showcase on April 11 and the release of the music and music videos on April 12. The album activities of GreatGuys will be released on August 25, 2017, the first single ‘LAST MEN,’ the second single ‘GANDA’ on April 7, 2018, the first mini album ‘Take Off’ on September 4, 2018, and the next single ‘TRIGGER’ on April 12. ‘TRIGGER’ is the fourth album in total and the third single, is the one created by the support of ‘Grace(Fandom)’, GreatGuys said "We'll never forget to thank you for the fandom ‘Grace’ that who led us." The GreatGuys will be followed by domestic broadcasting activities with the release of their single ‘TRIGGER,’ while the 2019 world performances will start their world tour from "Osaka" in early May.